Our product range includes a wide range of polki maang tikka, pearl maang tikka, green emerald maang tikka, emerald maang tikka, ruby maang tikka and emerald polki maang tikka. 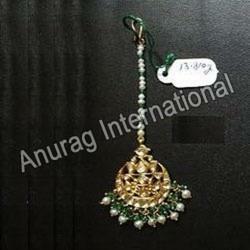 We specialize in manufacturing and exporting a designer range of Polki Maang Tikka. Exclusively designed and developed these tikka are suitable to add an extra glamour and charm to the personality of the wearer. We offer tikkas in various exclusive designs, unique patterns and different textures as per the exact demands of clients. Our tikka are specially designed following latest fashion trend and applauded for classy touch. Owing to the presence of experienced craftsmen, we have been able to manufacture and supply a designer range of Pearls Maang Tikka. These are exclusively designed in accordance to latest fashion trend and acclaimed for appealing look, excellent finish and elegant designs. The latest embedded design of our tikka make these one of the most preferred choice of clients. Our tikka are offered at cost effective prices. As a quality-oriented organization, we are focused to provide our clients an exquisite assortment of Green Emerald Maang Tikka that is a perfect blend of creativity and elegance. Our maang tikka is designed by artistic designers by making use of supreme grade material & best techniques in fulfillment with the trends of market. Offered maang tikka is very trendy and can be teamed up with any attire. Moreover, this maang tikka is available from us in various sizes & customized options as per the individual preferences of clients. Counted as one of the renowned manufacturers and suppliers, we are engaged in offering a unique collection of Emerald Maang Tikka. Aesthetically designed these tikkas are widely preferred by large number of fashion loving ladies owing to fine craftsmanship, unique design and appealing look. These can be availed in variety of patterns, designs and shapes as per the demands of clients. Moreover, these are available at pocket friendly rates. 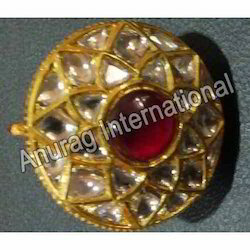 Counted as one of the renowned manufacturers and suppliers, we are engaged in offering a unique collection of Ruby Maang Tikka. Aesthetically designed these tikkas are widely preferred by large number of fashion loving ladies owing to fine craftsmanship, unique design and appealing look. These can be availed in variety of patterns, designs and shapes as per the demands of clients. Moreover, these are available at pocket friendly rates. 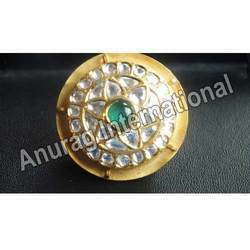 Being one of the reputed manufacturers and suppliers, we are involved in offering a designer range of emerald polki maang tikka borla. Uniquely designed these borlas are widely applauded for fine finish and exclusive craftsmanship. We offer different textures, patterns and designs of these borlas following the demands of our clients. Customers can avail these borlas at pocket friendly prices. 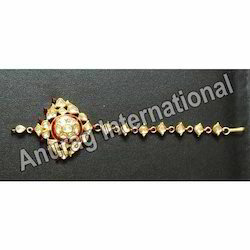 Being one of the reputed manufacturers and suppliers, we are involved in offering a designer range of Polki Borla with Ruby. Uniquely designed these borlas are widely applauded for fine finish and exclusive craftsmanship. We offer different textures, patterns and designs of these borlas following the demands of our clients. Customers can avail these borlas at pocket friendly prices.